← Favorite Things Friday: Reading… and a Surprise. Yesterday I had a crazy craving for an egg salad sammie. So, I put a few eggs in a pot, covered them with cold water, and set to boiling them. Just as I was prepping the ice bath for the boiled eggs, I looked in the fridge and realized that I had maybe 3 tablespoons of Mayo left. Deciding to save the eggs for tomorrow, I resigned myself to a boring old salad and started pulling ingredients out of the fridge. That’s when I saw him. That delicious, life saving veggie. Sitting there in my fridge. 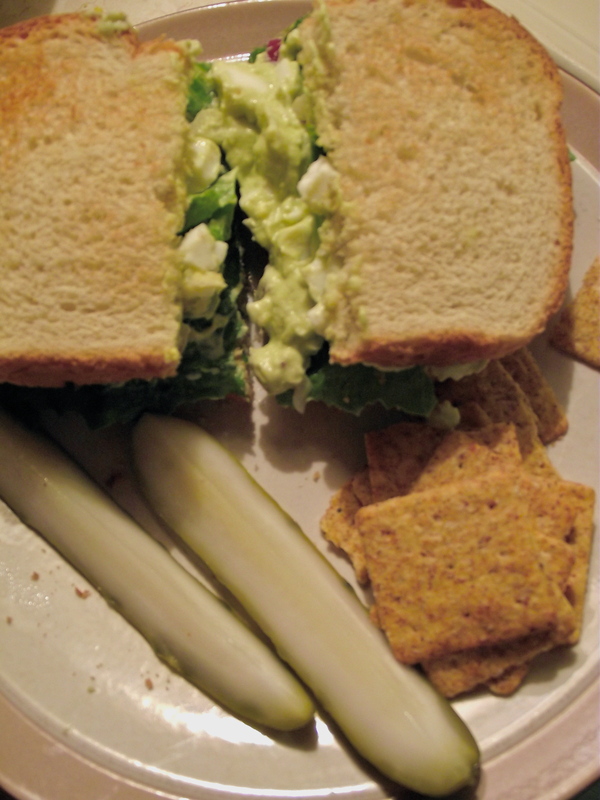 Mr. Avocado, meet egg salad. I was going to throw in some Dijon Mustard, but I realized that the bottle in the fridge was a) expired and b) pretty much empty. It tastes great without, though. I used a potato masher to mash up the avocado and the eggs and then I added all the other ingredients. Not too tricky at all. Toast up a couple slices of bread and pair with lettuce on a sammie. The verdict: It’s delicious. David and I decided that we don’t want to make our Egg Salad any other way ever again.